March 2nd is the birthday of Theodor Geisel, better known as Dr. Seuss. Last year, we celebrated by having our very own meal of Green Eggs and Ham! Well, sort of, anyway. I forgot that it was Dr. Seuss' birthday until the kids came home from school and told me. They were all excited about it, so I scratched my original dinner plans and improvised. I didn't have any ham, so we used pork chops (hey, they both come from a pig, right?) and scrambled eggs. All I did was add a little green food coloring to the eggs as I scrambled them. For the pork chops, I simply pan fried them, then added a little bit of water and green food coloring to the last few minutes of the cooking. The kids LOVED it!! This year, I'm going to try to be a little more authentic. I picked up a ham steak which I'll cook just like the pork chops and I'm going to try fried eggs. I'll separate the egg whites from the yolk. I'll add green food coloring to the whites, put it in the frying pan, then add the yolk. The yolks will still be yellow, but I think it will still look a little more like the book. For my son's 7th Birthday, we had a Super Mario Brothers' theme. I wanted to keep party costs down (gosh, can birthday parties get expensive really quickly if you're not careful!) and I'm not a fan of junky party trinkets for guests. Since we were going to have less than a dozen kids, I wanted to make each guest something to wear. At first, I tossed around the idea of some kind of shirt using freezer paper stencils, but ultimately decided on hats/crowns for each guest. I found some great tutorials online and I was really pleased with how they turned out. While they did take a little bit of time (especially the crowns), they were really inexpensive and relatively easy to make. Birthday boy, Mario, and his sister, Princess Peach! The Princess Peach crowns were definitely more time consuming (and it figures that we were going to have twice as many girls as boys at the party!) I ended up sewing all the pieces and layers together. I probably could have just used hot glue, but I figured the girls would be more likely to use the crowns more often as dress up and I wanted them to be sturdy. For the basic crown design, I used the pattern and tutorial found HERE. Then, I used the Princess Peach crown shown HERE , to inspire our decorations. The only other changes I made were to use yellow flannel instead of the felt to cover the elastic in back and to use some sparkly, sequin-y fabric for the "jewels" on the crown. I was so pleased with the way they both turned out! The kids wore them for the whole party and looked so cute. All of our Marios and Princess Peaches! Sometimes I've found that the simplest little things help families come together to create the most meaningful traditions and memories. A few years ago, my cousin told me how she makes special birthday pancakes shaped like the number of the age her children were turning. (Thanks, Tiffany!) I started the same tradition at our house and my kids look forward to their special breakfast every year. I especially like doing it because we often have to schedule their parties a few days before or after their birthday, so these pancakes are a great way to make their actual birthday morning special! Use the pancake batter to form a number. It will spread out quite a bit as it cooks but my children never seem to mind that the finished pancake is somewhat deformed. Squirt a few dollops of whipped cream onto the pancake (I try to do the same number as their age) then shake some sprinkles over the top. While certainly not the healthiest breakfast, it's definitely a memorable one and makes a great start to their special day. Unfortunately, this post isn't going to have any photos to accompany it, but it was such a neat activity for the kids when they were little that I'm going to share it anyway. I'm pulling it out from the "Way Back When" files in the far corners of my Mommy Brain. It's perfect for these late winter/early spring months when it's not quite warm enough to play outside every day, but you and the kids have cabin fever and are desperate for some new activities to keep everyone happy and occupied. * variety of containers, cups, funnels, etc. So simple, really! Spread the sheet on your floor. Put the container in the middle of the sheet and fill it with rice. Allow your child to use the little containers, cups, funnels etc. the same way they would in a sandbox. My kids could sometimes play for ages with the rice ~ pouring it from one container to another, using an empty parmesan cheese container to sprinkle it, making roads for their matchbox cars, etc. When playtime is over, simply pour any rice that spilled on the sheet back into the container, put the lid on your box and tuck away for another day. Even if a little bit of rice gets on the carpet or floor, it's easy to vacuum up. If you haven't heard about using freezer paper to create stencils for fabric, you have to check this out! It's a really easy, inexpensive way to add words or simple images to t-shirts, pillowcases, tote bags and more. You can usually find freezer paper near the waxed paper or aluminum foil at larger grocery stores, warehouse stores or your Target or Walmart. 1. Cut off a piece of freezer paper a little bit larger than the image you'll be stenciling. Lay the freezer paper shiny side down on top of the image and trace the design onto the paper-y side. If you have one of those handy Cricuts or similar machines, you have even more options for cutting out designs. 2. Using the scissors or exacto knife, cut out your stencil. If you're doing letters like A, O, B, R, etc. make sure you also cut out and save that inside shape. You'll need it to make your letter complete. 3. Put your iron on a medium heat setting (no steam). Place the freezer paper stencil shiny side down on your fabric and iron it down where you want your design to be. (You can pull it up and iron it down again to reposition it if necessary) You'll see that with just a few quick passes with the iron, the stencil will adhere to the shirt. Take special care to make sure all the edges of the stencil are firmly adhered to the fabric so you'll get a nice crisp line. When the stencil is ready, slip a piece of cardboard or small stack of newspaper inside the shirt so the paint won't bleed through. 4. Next, begin painting! I've had the best results using those inexpensive foam brushes. I like to start my painting strokes on the freezer paper and then brush onto the fabric. (If you start on the fabric and go out onto the paper, some paint may seep under the edge.) Once I've done all the edges of the design, then dab the brush straight down onto the fabric until the stencil is filled in. It's definitely better to do a couple light coats of paint, rather than glop on tons at one time. You can do more than one color, just let the first one dry before doing the 2nd. My love bug and her "heartbreaker" buddy! Today was the 100th day of school for my children. My son had the assignment to assemble a collection of 100 items that he could bring in or wear to share with his first grade class. We decided that we wanted to make this a wearable assignment and tossed around the idea of doing something with hearts since the 100th day fell on Valentine's Day. It was determined, though, that hearts might be a little too "girly", so we went with his other love ~ sports!! I had a baseball print fabric left over from another project, he had a red shirt in his closet that would be perfect, and I had some Heat'n Bond Ultra Hold Iron-On Adhesive . His assignment cost us nothing extra, turned out really cool and is totally something he can wear more than once. 1. I ironed the Heat'n Bond to the wrong side of the baseball print. Then, I just flipped the fabric over and started cutting out the individual little baseballs. The paper backing made it really easy to cut the fabric ~ it's just like cutting a piece of paper. While the paper did make it easy for me to cut, the small shapes would have been a little tricky for my son to do 100 of them. So, being the nice mom that I am, I cut and just had him count! 2. Once the baseballs were all cut out, we peeled the paper backing off of the first ten, and lined them up across the top of his shirt. 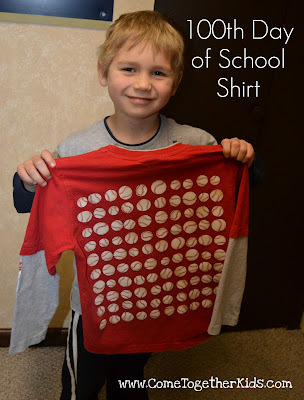 I ironed that row on, then we just repeated the process for nine more rows until we had 100 baseballs neatly lined up on the back of his shirt. Hard at work lining up all those baseballs! The ultra hold Heat'n Bond should stand up to repeated washings just fine, so my son will have a cool shirt to wear to school today and then be able to wear it throughout this spring's baseball season too. It didn't take much to impress my kids this morning! No fancy gifts or expensive treats, just a little red food coloring and some creative batter pouring! Granted, the heart shapes weren't perfect and the pretty pink color turned slightly tan once they cooked. However, with a few dollops of whipped cream and a sprinkling of colored sugar, it was still a really special breakfast! Still a little sleepy, but ready to dig in! My oldest daughter (8 years old) and a few of her friends are in a little book club. Once every month or so, they get together to read a short book and do a little project or activity that relates to the story they read. This past Friday, we hosted a Valentine's themed book club. The girls had a great time ~ the book we chose was really cute, they did an awesome job on the craft, we made some yummy little homemade pizzas for dinner, and then they played with the Chocolate Playdoh we'd made here a few weeks ago. 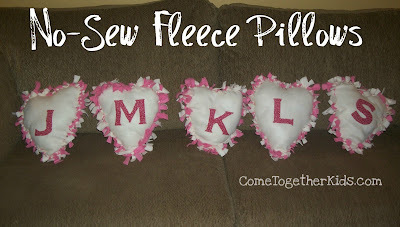 Next, we did our little craft project ~ some No-Sew Fleece Pillows. Unfortunately, I don't have photos for each and every step. I was either trying to clean my house while getting all the project prep work done or engaging five giggly girls while doing the actual craft. However, I'll do my best to explain it and will gladly go into more detail if you have any questions. I did steps #1-3 prior to the girls' arrival, the rest were done at the book club. 1. First, I cut two large heart shapes out of my fleece. My hearts were approx. 17" x 21" . 2. Next, using a light colored washable marker, I drew a smaller heart about 3-4" inches in from the outside edges. This line gave me the guide of how far in I should cut my fringe strips (you can kind of see the faint yellow line on the picture below) . I then cut 1/2" strips all around the perimeter of my heart. I cut the little pieces off the bottom so the heart comes to a point. 3. Then, I ironed the Heat'n Bond to the wrong side of my cotton fabric. (directions are on the package, just a few seconds using the medium iron setting). I traced each girl's initials onto the Heat'n Bond paper, making sure the letter was flipped backwards so when we cut it out, the letter would be facing the correct way on the right side of the fabric. 5. Now, it's time to tie! Line up the front and back pieces of each heart (wrong sides together), then tie each set of strips in a double knot. Go all the way around your pillow until there's only 5 or 6 strips left untied. 6. Before we stuffed the pillows, I had each girl write a little message to each of their friends on a small paper heart. We then tucked those little friendship notes inside the pillow as we stuffed them! Taking a handful of stuffing at time, push it into the opening until the pillow takes its form and reaches the desired firmness. She looks so serious here, but the girls really liked this step! 7. Tie up the remaining 5-6 strips and your pillow is complete!! A few weeks ago, I posted the fun we had making Fleece Boa Scarves. We've since made a bunch more of them and I discovered that I really enjoy working with fleece. It's inexpensive, cozy & colorful, and you don't have to worry about finishing the edges. I'm also really loving scarves this winter for me and my girls ~ such a cute way to add a little style. 1. Cut your fleece strips. Since my scarf was going to be for a child, I made them approx 6"x46". 2. 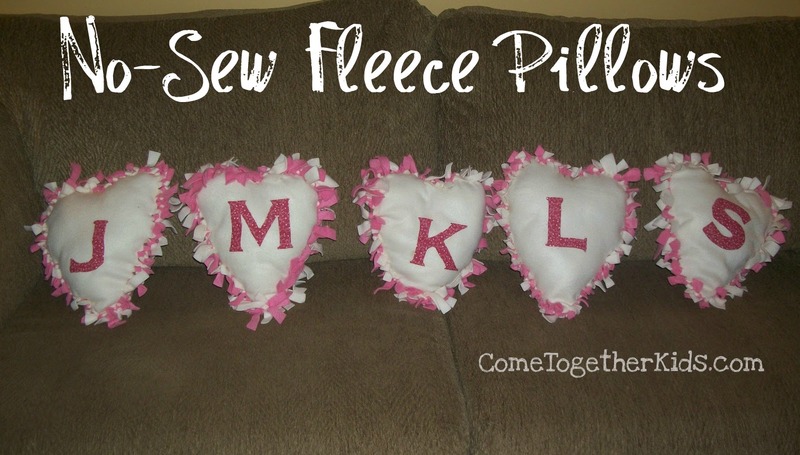 Starting approximately 5" from one end, sew down each long edge and across the short edge. I made my seams approx. 3/4" on the long edges because I knew I wanted to go back with the pinking shears at the end. If you don't want to pink the edges, you can make your seams 1/4". On the short ends, sew across about 5 inches from the edge so you can cut fringe. 3. Using a washable marker, lightly draw the shape of your applique. Then stitch over the outline. 4. Next, cut away the top layer to reveal the shape in the bottom color. To do this, pinch the top layer of fleece, make a small cut, then cut as close to your stitching as you can without cutting into the bottom layer. 5. Make two marks approx. 12" and 15" inches from one end of the scarf. Cut three pieces of coordinating scrap fleece, approx. 1"x 8", then braid together. 6. Pin the braided strip to the marks you made and stitch onto the scarf. Go back and forth with your stitching to really secure the braided loop. 7. Put the finishing touches on your scarf. Using a damp cloth, dab around your appliqued shape to remove the marker. Trim any loose threads. Use pinking sheers to cut along the edges of the scarf and cut fringe at the ends. Use a small pair of scissors to fringe the ends of your braided loop. 8. Give the adorable scarf to a super cute, special someone! I really like how that added loop helps keep the scarf in place ~ no more lopsided scarves to drag on the ground! One of my loves ~ Kid #3! that sparkle but don't melt? 1. Make your snowflakes. You can make any flaky design you'd like out of the pipe cleaners. We cut ours into 5" and 2" pieces. We took three of the 5" pieces and twisted them together to make a star shape. Then we attached the smaller pieces to the ends to make it look more like a snowflake. 2. Prepare your crystal solution. The amount depends on the size of the container you'll be using. Use the ratio of three tbsp. Borax for every cup of boiling water. Make as many batches as you need to fill your container so the liquid is deep enough for the snowflakes to be suspended upright in the solution. 3. Tie one end of a piece of string to your snowflake and the other to a ruler, large spoon, etc. to suspend it in the solution. Try not to have the snowflakes touching each other in the solution or they'll mold together. 4. Allow the snowflakes to sit in the solution overnight. When you wake up, gently pull them out. 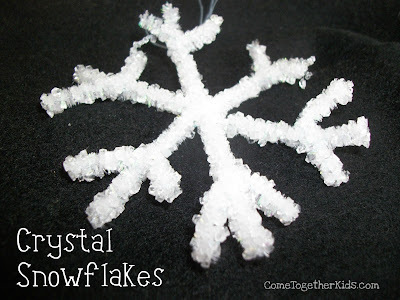 You'll see that beautiful crystals have formed on the pipe cleaners. Let them dry and then use them to add a little wintry sparkle wherever you'd like. Years ago, I used this technique with rubber stamps to make the favors for my wedding. One night when I was thinking about crafty stuff while trying to fall asleep (does anyone else do this too? ), I thought I could adapt it to use the kids' drawings instead of rubber stamped designs. It's a clever technique and a cool way to bring the kids' creativity into your home decor. They'd make awesome little gifts too! 1. Cut a piece of tissue paper to fit around the outside of your candle. You'll want it a little smaller than the candle itself. 2. Using markers, have your child decorate the tissue paper. The tissue paper is pretty delicate (obviously! ), so encourage simple drawings and discourage coloring in large areas or the paper might tear. Cute drawing and inexpensive dollar store candle. 3. When the drawing is completed, get a piece of waxed paper slightly larger than the candle. Wrap the tissue paper artwork around the outside of the candle, then wrap the waxed paper on top of that, using the extra length as a little handle. 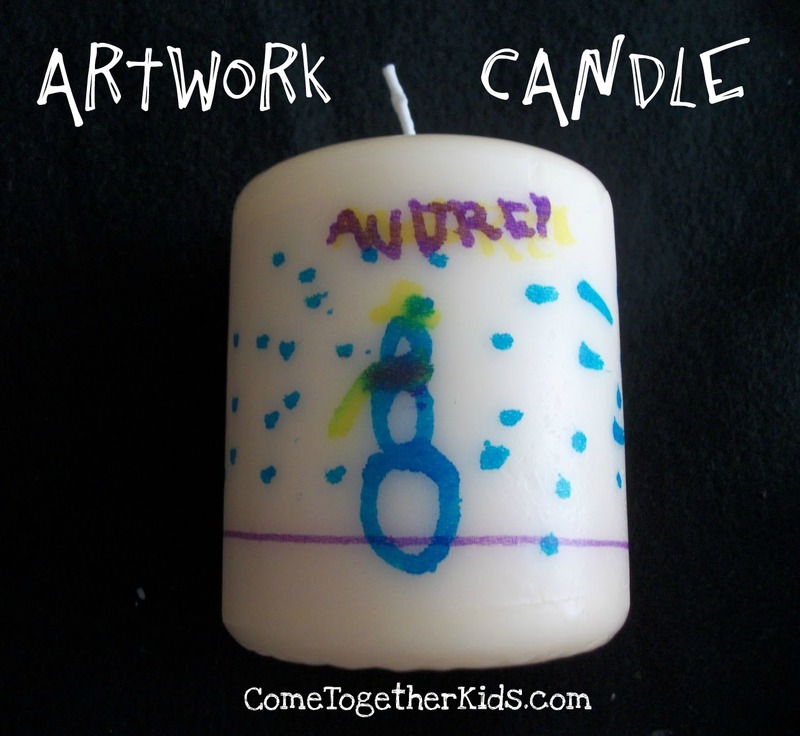 Wrap the drawing around the candle. Then, wrap the waxed paper around, making a handle. 4. 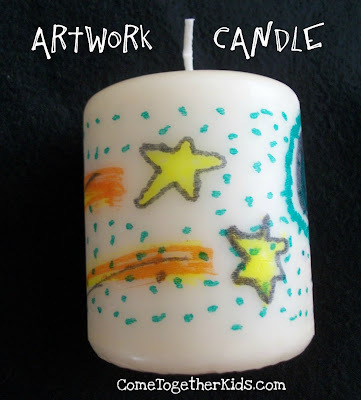 Next, use the hairdryer or heat gun to melt the design onto the candle. (The hairdryer works fine, it just takes a little while to warm up enough. Put it on the highest heat setting and hold it blowing as close as possible to the candle.) As the wax melts, the tissue paper will become part of the candle. You'll be able to see it change color through the waxed paper, going from white to the color of the candle. Continue until you can't see any more white tissue paper. Notice how the tissue paper near the name is still white, but it's the color of the candle to the right of the name . 5. Carefully pull back the waxed paper to reveal your child's artwork now as part of the candle. You can burn the candle just as you would any other candle. My youngest made a cute one too!